Schools are created to enhance skills, abilities, knowledge, and even the traits of people. These educational institutions comprise of numerous students and teachers who enroll in school in order to learn and teach new lessons. With this, school administrations develop strategies, tactics, and various documents that can aid their students and teachers to perform their tasks effectively. 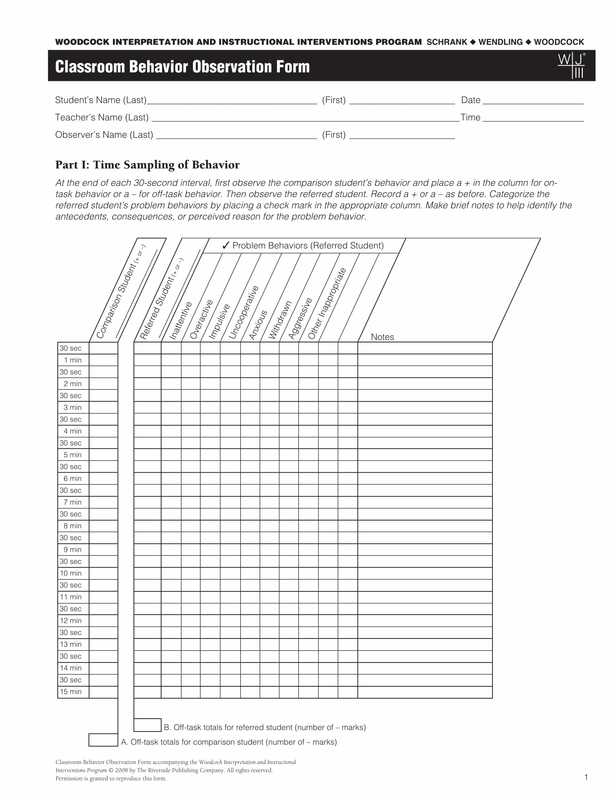 One of the most commonly used documents is a classroom observation form. 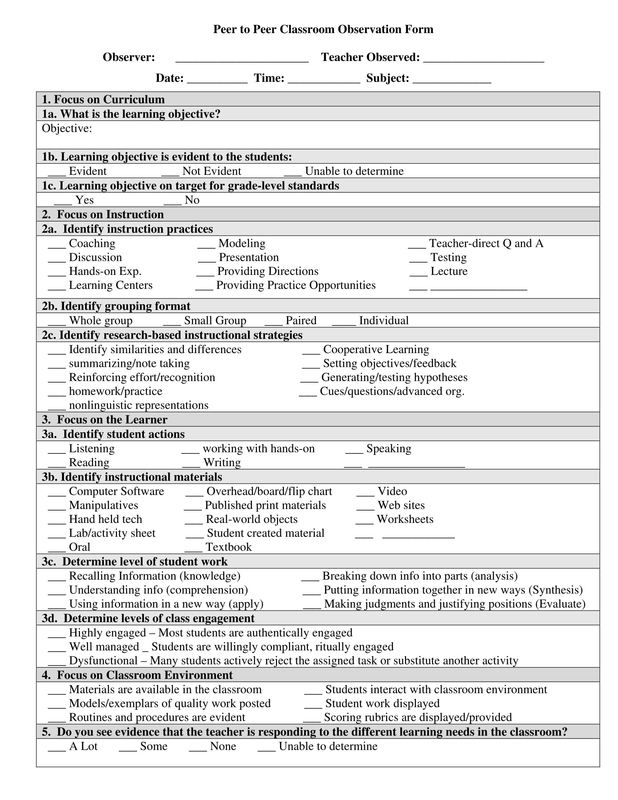 This is similar to other evaluation forms and assessment forms; however, it focuses on the aspects and the matters within the corners of a single classroom. 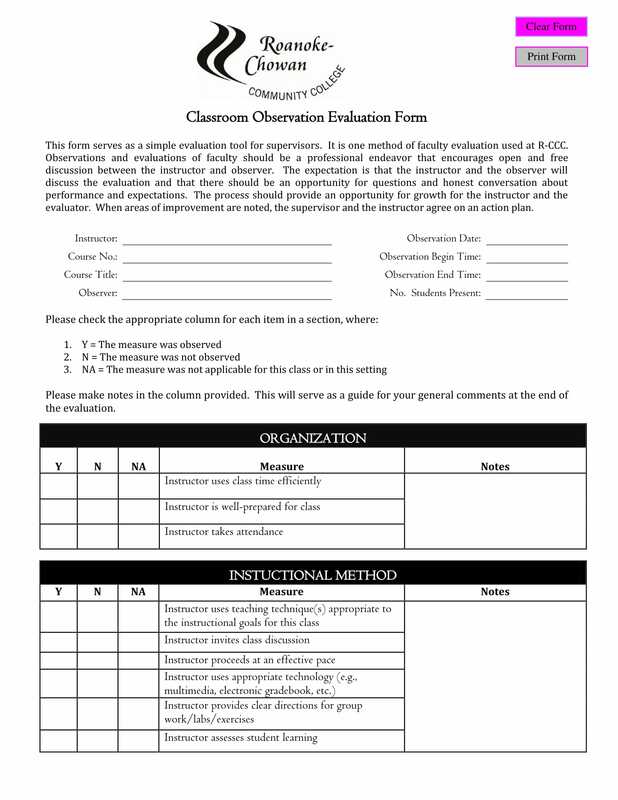 What Is a Classroom Observation Form? A classroom observation is a procedure that most educational institutions mandate their faculty to conduct with the aid of a classroom observation form. 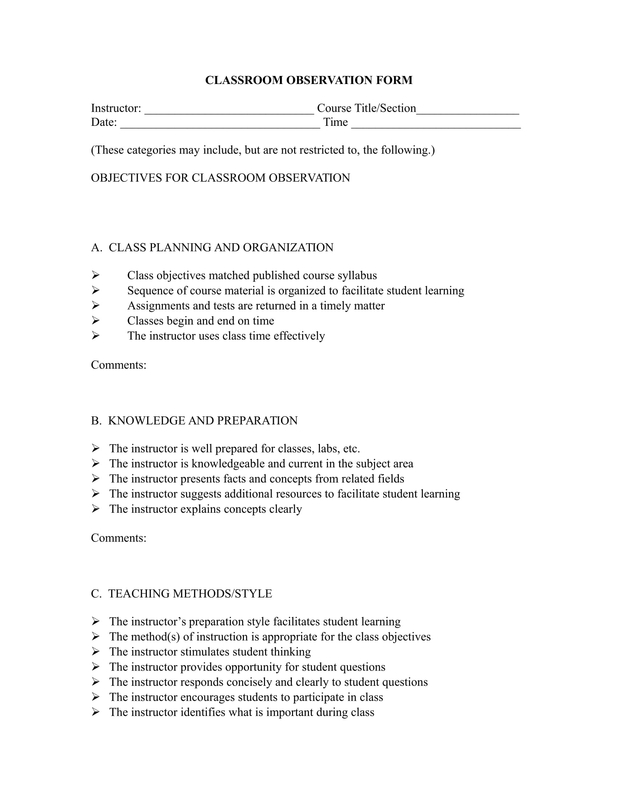 This document allows the user or the observer to state, record, and determine the overall rating of a classroom including the students and the teacher who is handling the daily lessons in class. The form has sections and tables where the observer can indicate his ratings as well as a comment area where explanations can be written. Common users of observation forms are practice teachers or practitioners who aim to learn the techniques of effective teaching in varying schools. Educational institution accreditors also use this form during the accreditation period of the school where there are standards set out in determining if the school is appropriate for catering the needs of the staff and students. Creating a classroom observation form is easy especially with the usage of computers and software tools. However, if you prefer to create your own document from scratch, you must first research and gather the classroom standards of your school or state. This is to aid you in creating the table for your evaluation which should be categorized depending on the relativity of the standards unto one another. After this, you can begin arranging the sections of your form beginning from the name of your school and its address. The bottom of your header should have spaces that are intended for the general information of the subject being observed such as the class schedule and the name of the assigned teacher. Along with these details is the date of when the observation was done as well as a space for the observer’s name. Then, the table for the standards and its rating scales should be placed alongside each other. Since the standards are grouped into relating categories, a comment section should be incorporated at the end of each group to separate and sum up the category’s ratings. Survey questionnaires that relate to the classroom observation procedure can also be included to acquire better explanations and suggestions from the observer. However, the questionnaires must be after the tables of the standards’ ratings. What Aspects Are Rated in a Classroom Observation Form? A single classroom can cater numbers of students and a teacher. However, classroom observation forms are not only for rating the people inside the room but also the surroundings of the area and the significance of the teaching materials being used by the teachers. A student assessment is also included in the process of classroom observation wherein the students are evaluated of how they manage the lessons in class and if they are properly acknowledged by their teachers. With regards to environmental assessments, the observer will determine if the learning environment or the room have fulfilled the educational needs of the students and if there are no barriers that can cause a distraction to some students present in class. Lastly, curriculum quality is also being observed of whether the lessons are appropriate for the students’ current grade level and subject. This assures that only related topics are being discussed and taught to the students to attain the school’s goal in educating and creating exceptional graduates. There are a lot of benefits in using a classroom observation form but one of the most common is that it serves as a documentation for the reasons why a specific score has been given to the educational institution. 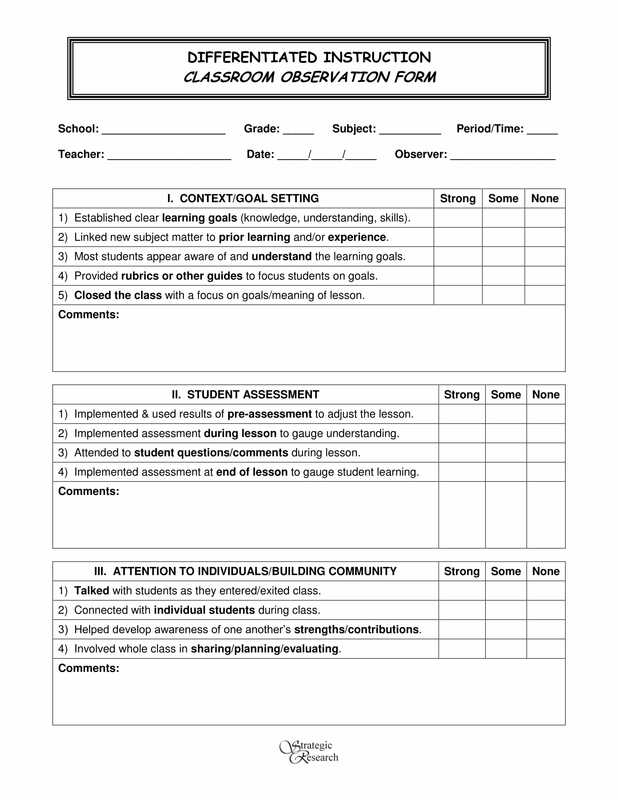 The form will be a tool for the school to distinguish what steps they must incorporate into their action plan to obtain a better rating in the next assessments. Additionally, if the scores and the reasons are explained as well as acknowledged, the subjects who were being observed will be able to know where they must improve and what aspect is their strengths that need to be maintained. Classroom observation forms may be simple and general documents but it is essential to the development of teacher, students, and the educational institution itself. This is why schools, regardless if it is a private or a public institute, must value the significance of this document together with the observation and assessment process. What is an Employee Feedback Form?